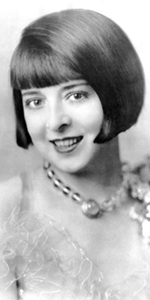 Colleen Moore was a popular silent film star, whose perky personailty, youth and bobbed haircut made her a fashion icon and role model for millions of women in the 1920s. Born into an oddly itinerant family who were living in Chicago when Colleen made her first film playing a maid in The Prince of Graustark for Essanay (released in November, 1916). 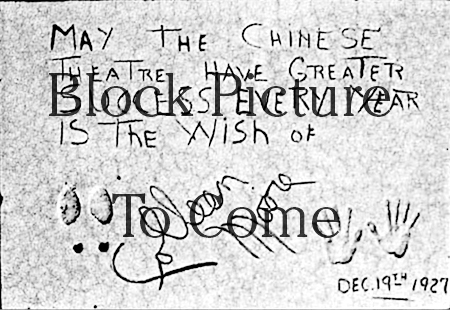 A year later, while living in Tampa, Florida, an Uncle arranged a gig with D. W. Griffith at his (by then) floundering Triangle Studios in Hollywood. Although Moore never worked with the master, she did three films for Triangle, but instead of continuing, she became a free agent instead. Moore began to appear in lead roles almost immediately; she played the lead in the spoof Little Orphant Annie for Selig Polyscope (released in December, 1918); her first feature-length co-starring role was in The Busher for Thomas Ince (released in May, 1919); she co-starred with Tom Mix in several films over at Fox: The Wildermess Trail (released in July, in 1919), and The Cyclone (released in January, 1920. This free agentry did her no favors; although she was liked by her directors and the public, she was not breaking into the better feature-length films becoming popular. She signed a contract with Marshall Neilan, who loaned her out to various producers. On one picture, she met First National producer John McCormick, who formed a production company to make her films. The two married in 1923. Their film adaptation of the sensational novel Flaming Youth (released in November, 1923) set the stage for Moore: in it, she appeared for the first time in her bobbed haircut. The story of a young woman getting caught up in extra-marital affair within her own family somehow caught the mood of the flapper era, and became a whopping hit. Moore continued making films for First National, but after Clara Bow began defining flapper chic, Moore had to find vehicles in which she could shine. She attempted a number of different types of films (including the first adaptation of Edna Feber's novel So Big (released in December, 1924), but while filming The Desert Flower (released in June, in 1925), she broke her collarbone, which required a lengthy recovery. Moore did recover and appeared in a pair of films which had her dancing: Irene (released in February, 1926) and Twinkletoes, (released in November, 1926). She played the comic strip character Ella Cinders (released in June, 1926) as well. It seemed as though all her films were hits. At her footprinting ceremony, she might have been working on her biggest film yet, the World War I drama Lilac Time (released in 1928). The expensive film carried her through the Warner Bros. / First National merger, but the sound age loomed. She only made two talkies, Smiling Irish Eyes (released in July, 1929) and Footlights and Fools (released in November, 1929). She quit the pictures after divorcing McCormack, got married to a stockbroker, hosted a lot of parties for the U.S. Olympic Team at the Los Angeles games in 1932, got divorced, returned to pictures, made three films (which bombed), then, remarried and eventually became a partner in Merrill Lynch. Proud of her film work, she made every effort to preserve her work, but many of her films are lost today. Moore published her autobiography, Silent Star, in 1968. She died of cancer in 1988, aged 88. Grauman's Chinese Theatre, Hollywood, California. 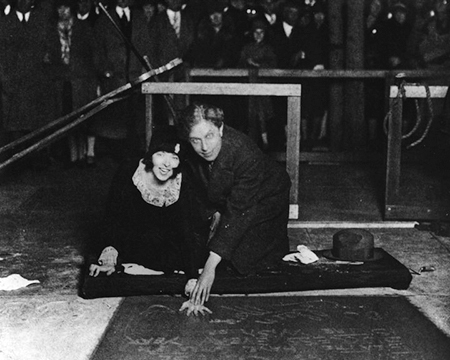 Colleen Moore Forecourt ceremony, Monday, December 19, 1927. Moore is assisted here by Sid Grauman.